Programmable business hour LED signs are the new must-haves for every establishment. Boasting new features and a whole lot more, the PHS-100 by AffordableLED.com comes at a low cost of $159. AffordableLed.com's latest innovation is the PHS-100, a programmable business hour sign equipped with the latest advances in led sign technology. 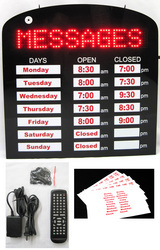 Leading LED signs distributor AffordableLED.com is now offering programmable LED business hour signs for only $159. Equipped with the latest advances in LED signs technology, AffordableLED.com's programmable business hour signs are capable of programming multiple messages and boast as much as 10 animation modes. Featuring bright red LED signs that are viewable to as far as 150 feet away, the PHS-100 makes it easy for all passersby to view any message displayed in the LED sign. AffordableLED.com knows that establishments will have a greater chance of increasing foot traffic and thereby attracting new clients with programmable LED signs. Installing programmable business hour LED signs is a more effective means to advertise any establishment's operating hours for walk-in customers. Not only that, but the PHS-100 programmable business hour LED sign also has the ability to display daily specials, promotions, and even company website and information. All business establishments need LED signs to display important events and messages. It has been proven that foot traffic can increase to as much as 10% because of LED signs. Aside from being an important marketing tool, LED signs by AffordableLED.com are competitively priced and have low energy consumption, allowing for as much as 70% savings on electricity cost. Because LED signs are more energy efficient, these marketing products can be left to operate 24 hours a day, seven days a week. AffordableLED.com, a leading wholesaler of indoor and outdoor LED signs, continues to strive for the best when it comes to LED signs manufacturing and distributing. Backed by a strong warranty for all LED signs products, AffordableLED.com guarantees the quality of its LED signs and neon signs. Simply sign up with the company's newsletter or visit AffordableLED.com's official blog for the latest updates and promotions the company has to offer. Based in Southern California, AffordableLED.com is the leading manufacturer of indoor and outdoor LED signs. All LED signs are of high quality, produced with cutting edge technology. LED signs can be customized to suit the needs of the clients. All LED signs sold have a 1 year warranty and a lower-than-market price guarantee. Press release produced by Cybertegic.com - an Internet marketing services agency that specializes in search engine optimized press release marketing (SEO marketing). 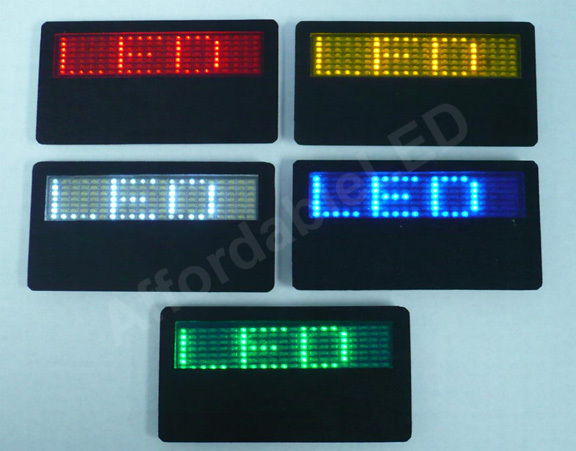 Other programmable led signs are also available at AffordableLed.com, such as the NS-300A, an amber name tag featuring 6 display modes.